Morah Katie: What will we need for our trip to Antarctica? Jack: Shelter from the polar bears. Morah Katie: We will need shelter, but not from polar bears. Polar bears live in the Arctic, at the top of Earth. Antarctica is at the bottom of Earth. What animals do you think we will see there? 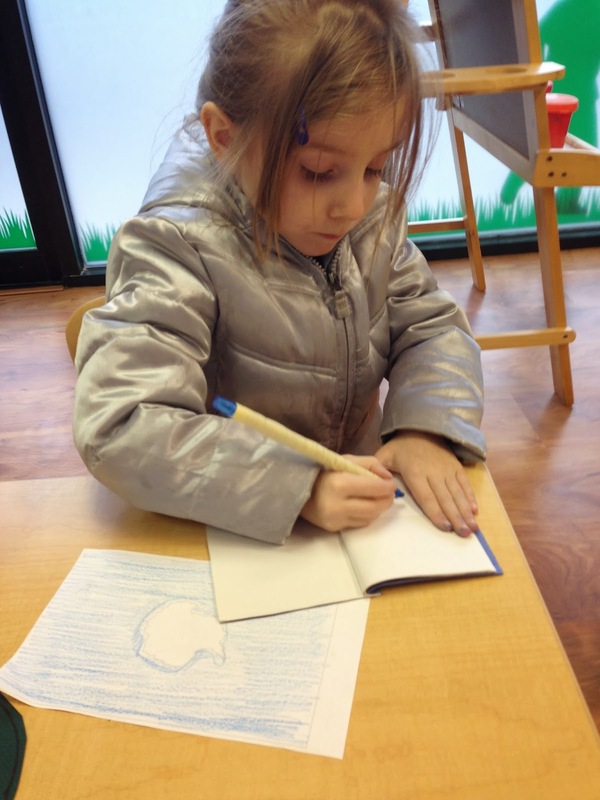 Morah Katie: What can you tell me about penguins? Anton: The mom fishes and spits the food out for the baby. Abigail: The dad keeps the baby warm. 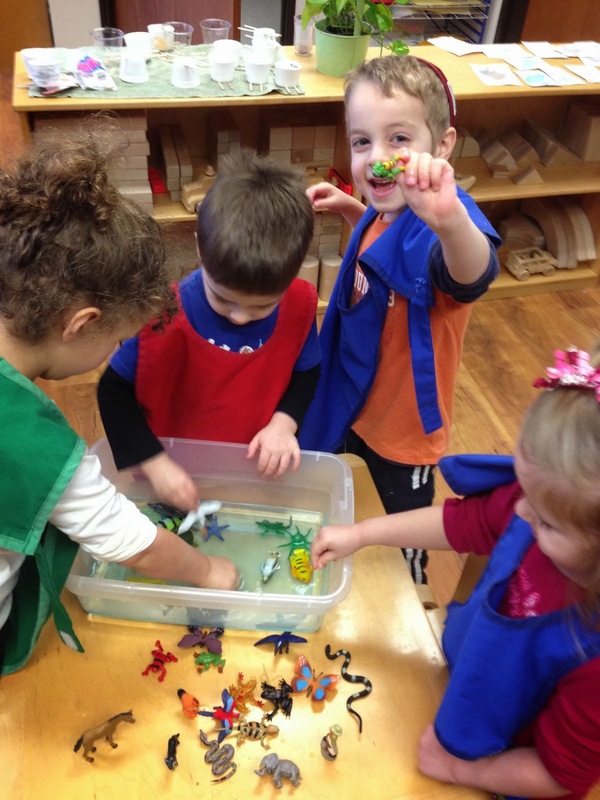 Isaac: They swim a lot with their wing flippers. Scout: They live in Antarctica. Gracie: They are black and white to be camouflaged. The children were completely enthralled as they watched the mom and dad penguin gently scoot the egg between them to keep it warm. 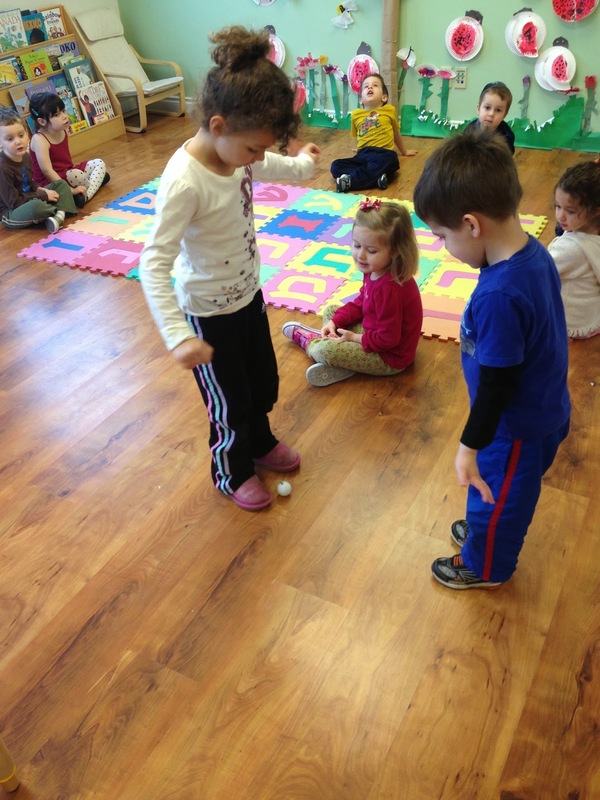 We pretended to be mama and daddy penguins taking cares of our egg. Gracie: The mama pushes the egg to the dad with her feet. Then the dad keeps it warm. While exploring with the water bin, Morah Amanda had a discussion with some of our friends. 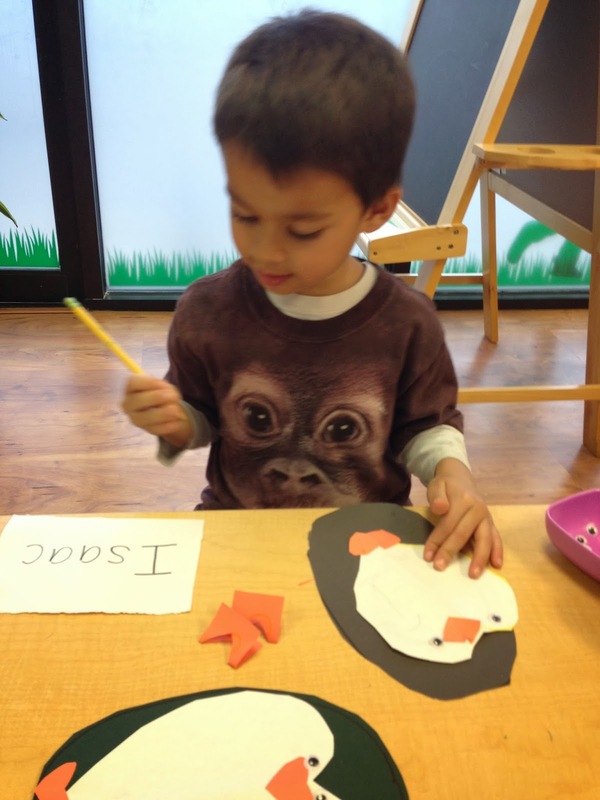 Morah Amanda: Let's look at some pictures of animals in Antarctica. What colors do you see? Morah Amanda: Why aren't the animals more colorful like in the rain forest? Efraim: Penguins have white like the snow. Scout: The animals need to hide from other animals. 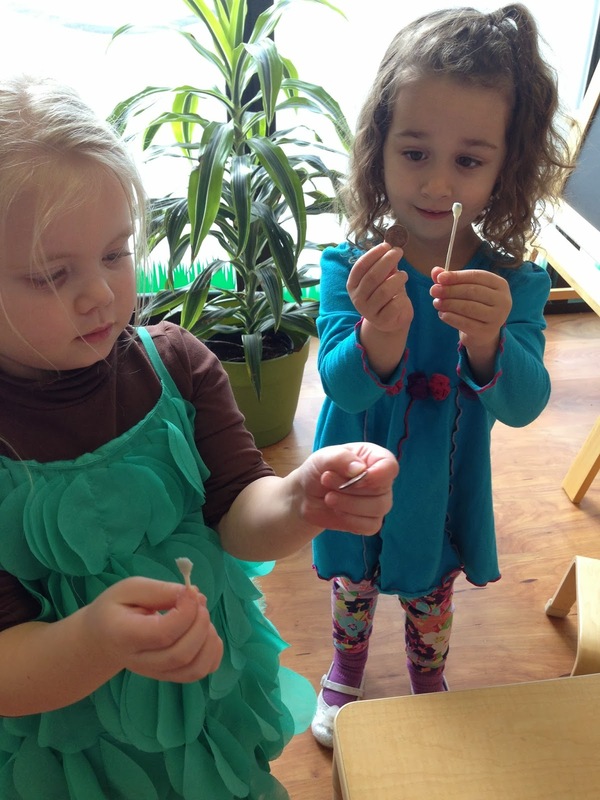 Morah Amanda: Snakes and reptiles need the warmth from the earth to heat them. Would we see them in cold Antarctica? Efriam: It is too cold in Antarctica. 5 black and while penguins sitting on a cold iceberg! Morah Katie: Instead of learning one new language this week, we have been saying Good Morning and Good bye in English, Hebrew, Japanese, Swahili, French. We are in Antarctica, why are we speaking so many different languages? Zim: Because everyone can go there. Morah Katie: Most people who visit Antarctica are explorers and scientists. 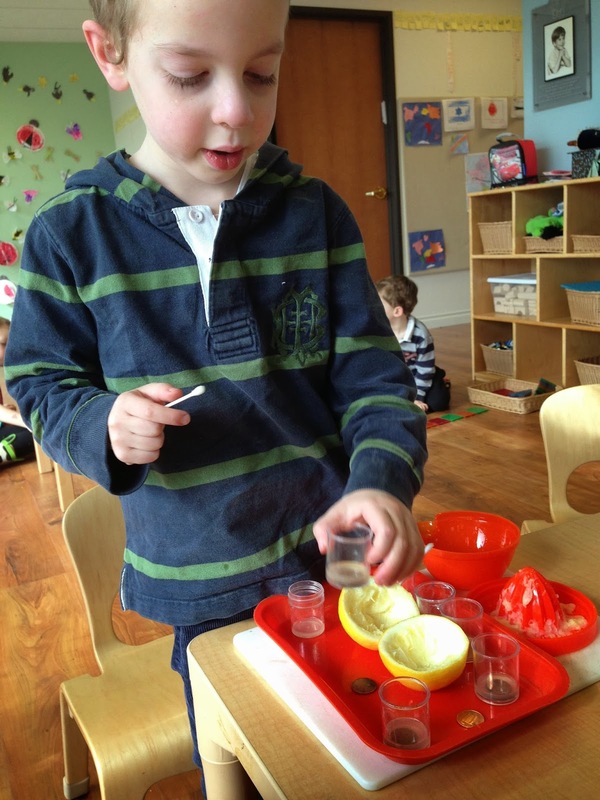 This week we are going to be scientists and run a few different experiments. Experiment #1: Can we trap salt? 1. Draw a shape on paper. 2. Place a spoonful of salt inside the shape. 3. 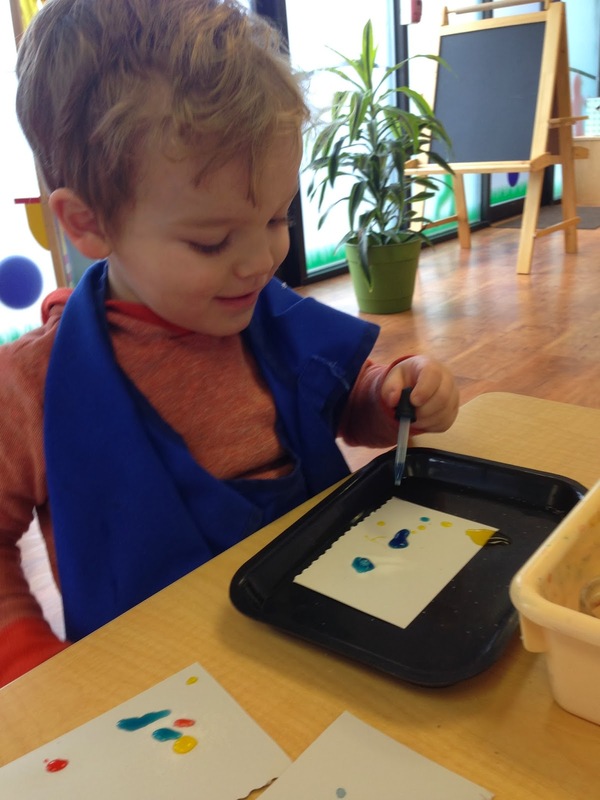 Make a larger shape around salt with water color paint. 4. 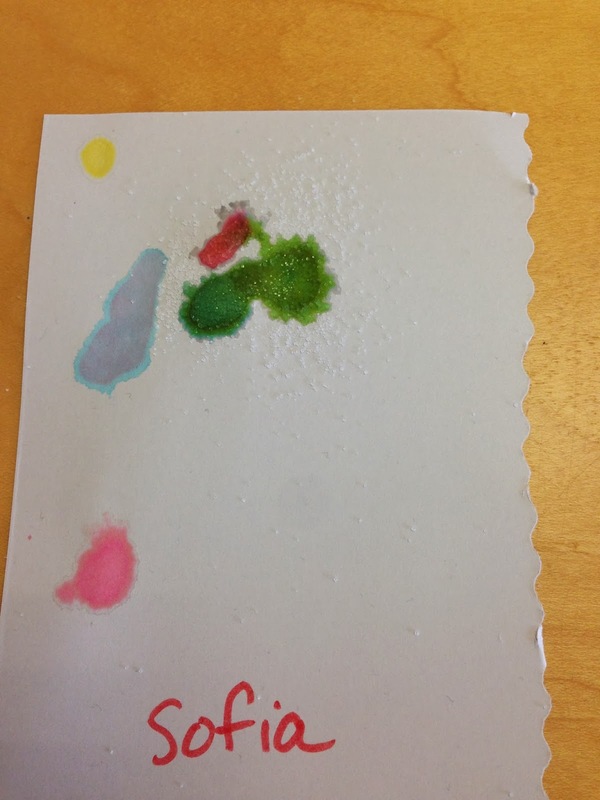 Tilt paper to slide salt. Ella: The salt is not going out of the circle. Gracie: It is like a mountain of salt with a peak. 1. Place a spoonful of salt on paper. 2. 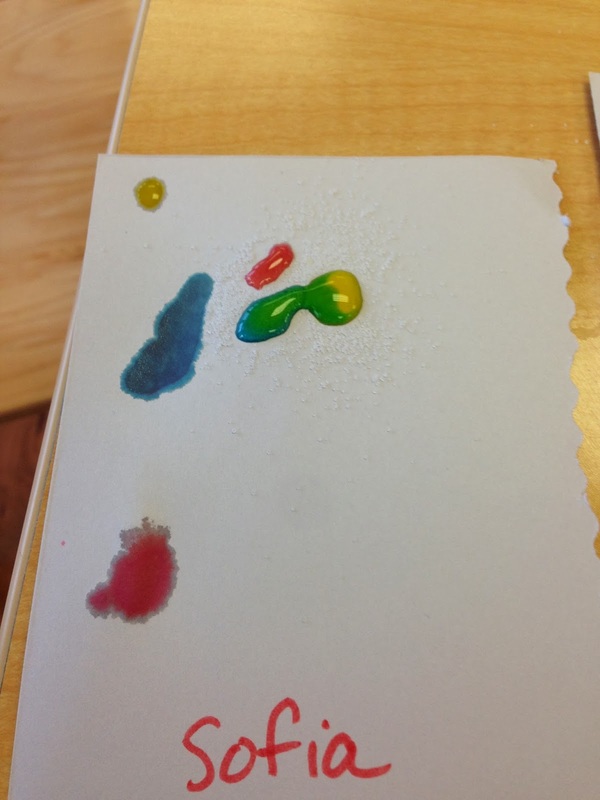 Use a dropper to drop 1 water drop on paper. 3. Repeat on the salt. 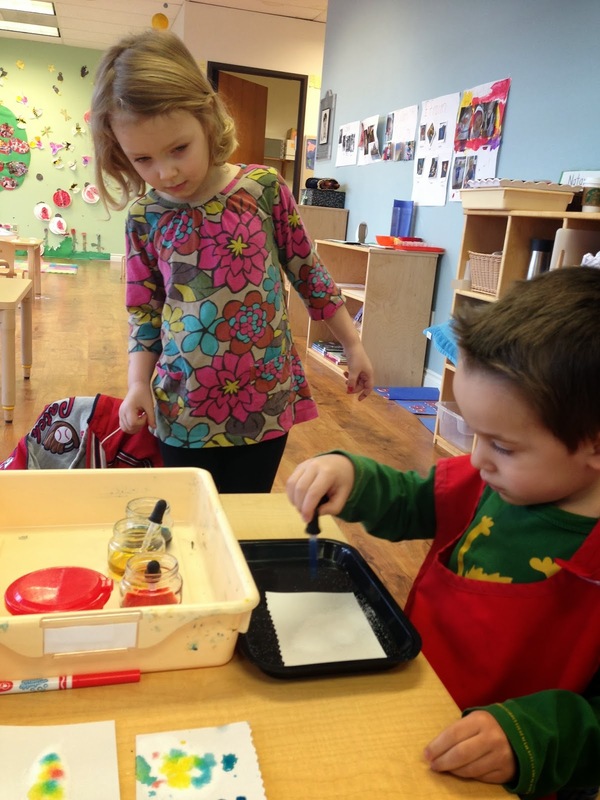 Evan: It is making bubbles. Scout: The salt is absorbing the water so there are no bubbles on the salt. 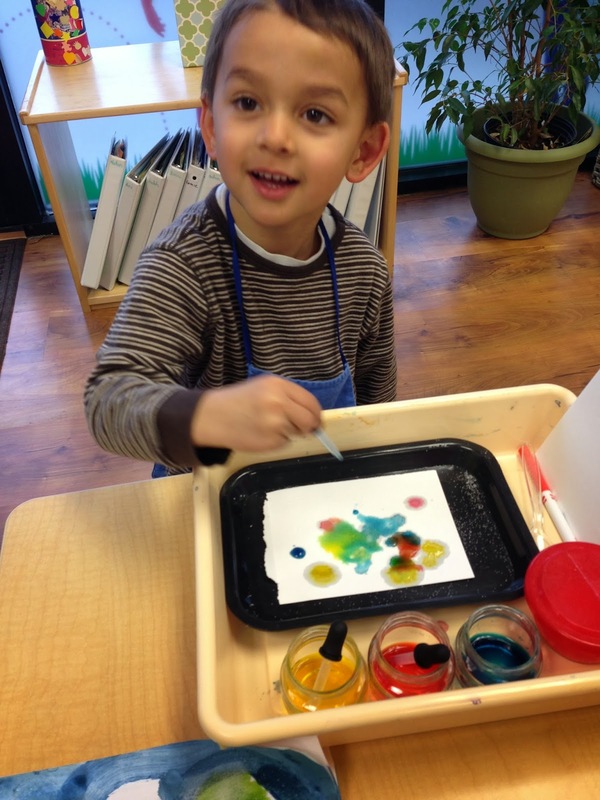 Anton: I made a pink bubble and now the colors are all mixing in the salt. Efraim: The salt pulls it all together. 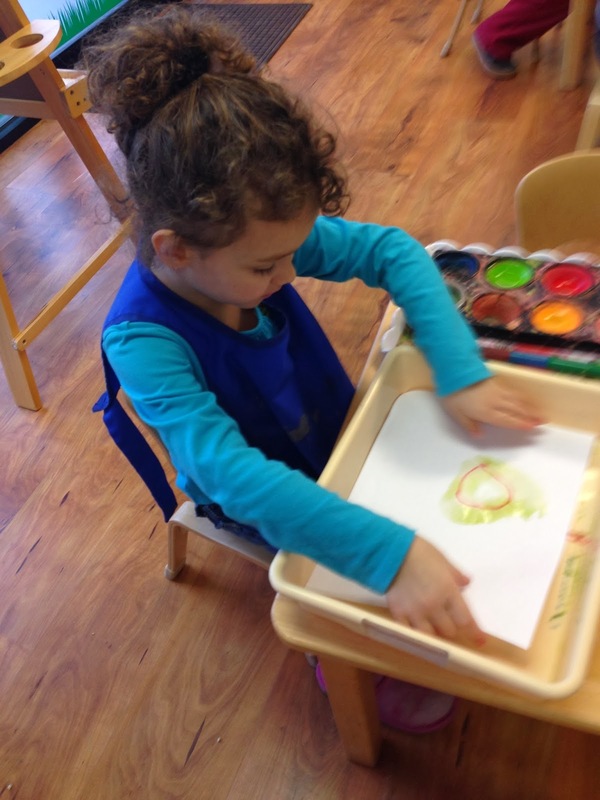 Sofia's colored salt while wet had a bubble of blue green yellow; when it had dried it was all green. Morah Katie: Sofia how did that happen? Sofia: It soaked together. It's Green. 1. Squeeze lemons for lemon juice. 2. 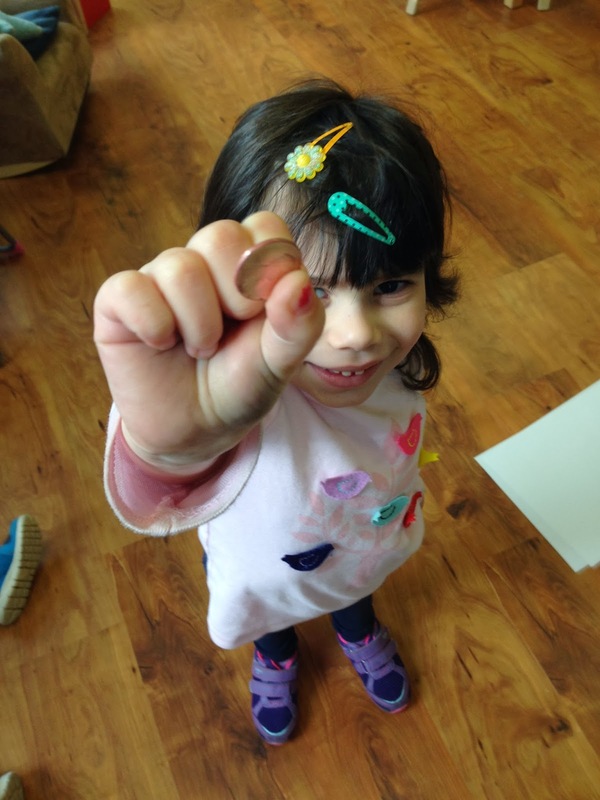 Place a penny in a small container. 3. Cover with lemon juice. 5. Wipe juice off with a q-tip. Amelia: It is all dark on the end (referring to q-tip). Efraim: It is getting shiny. Sroli: They are both cleaning. The Lemon smells good. 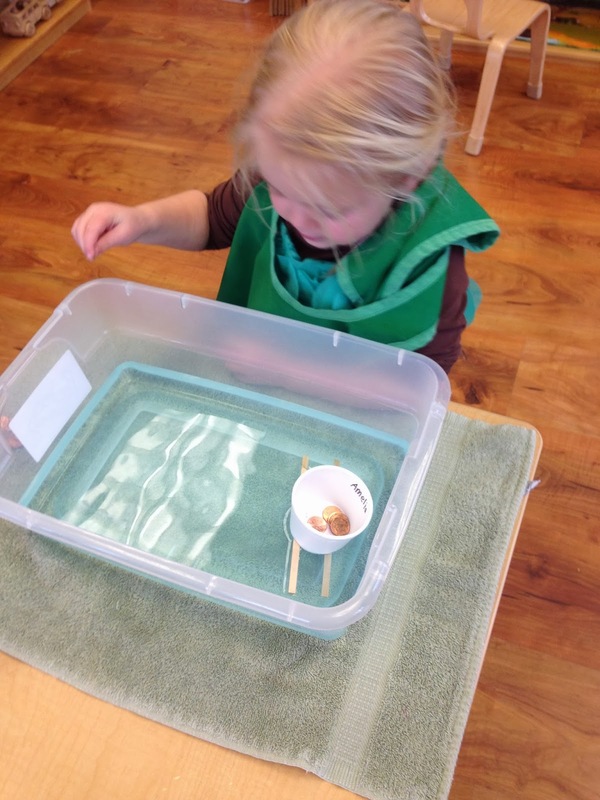 Experiment #4: How many pennies can float in a boat? 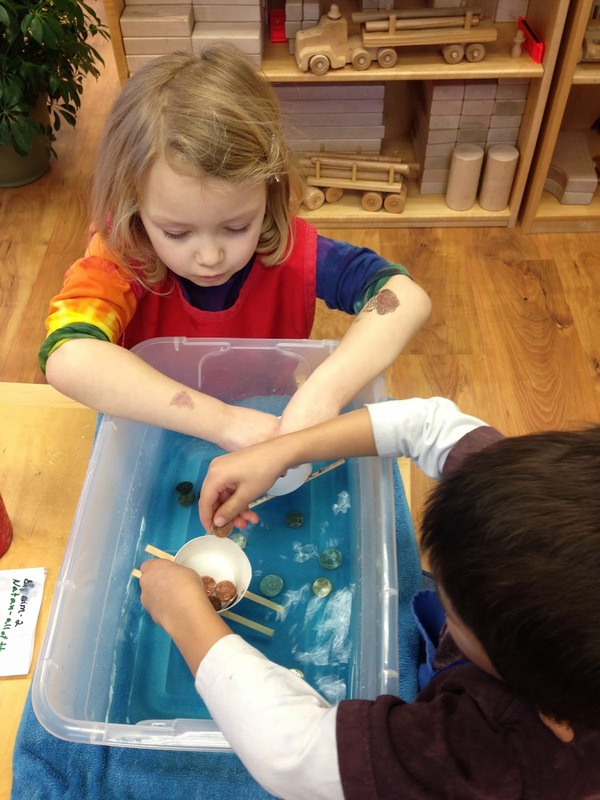 How many pennies does it take to sink a boat? 2. Place it in water. 3. Add pennies 1 at a time. Ameila: It is still floating. Efraim: When I blow on it it moves. 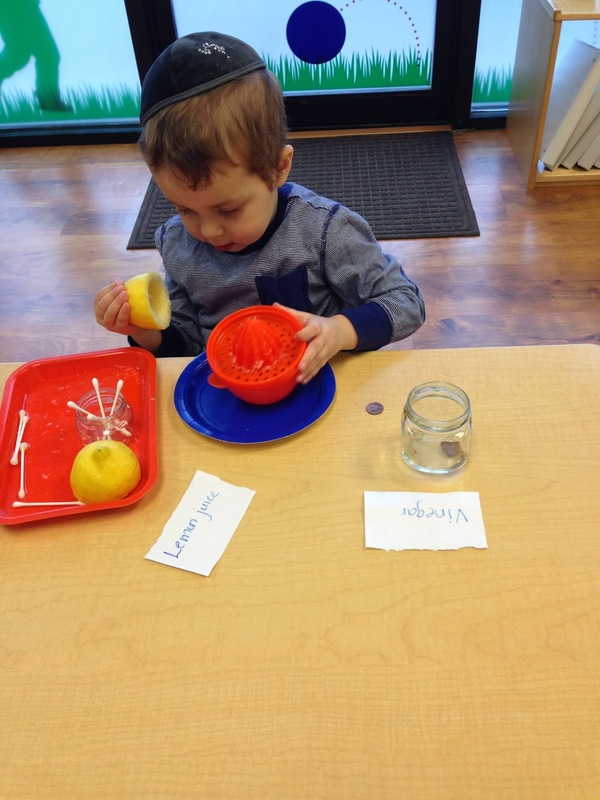 Anton: I put 4 pennies in my boat.